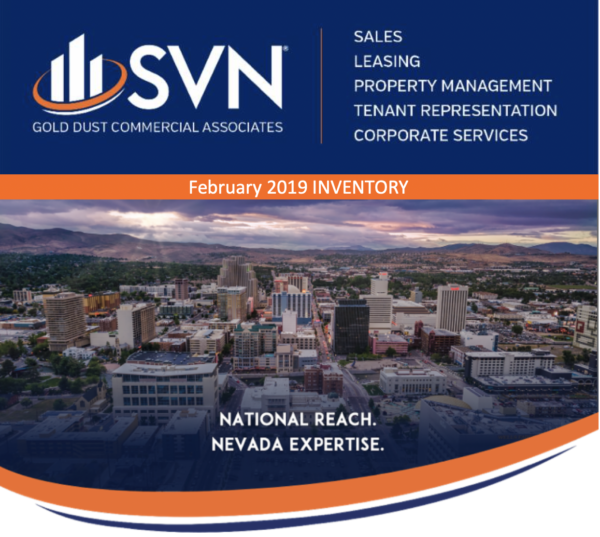 SVN Gold Dust Commercial Associates is pleased to present the inventory report for February 2019. Featured listings include an industrial piece of land located in the Northeastern urban area of Carson City, a flex industrial space located in Fernley, NV and an office and industrial flex space located in the Sierra Vista Business Park. Senior Advisor, Jack Brower, CCIM, represented Robert & Connie Hoff in the sale of a 115,600 square foot industrial building, located at 80 Airpark Vista Blvd. in Dayton, NV, for $6.4 million to Ozark Materials Nevada, LLC. Located just 20 minutes from the Tesla Gigafactory, the property also includes 12,000 square feet of Class A office space that is available for lease. The new owner will bring nearly 30 new jobs to the area as they increase the company’s west coast presence.